A popular mailbox for apartment blocks, student accommodation, and commercial offices, the H270-1 horizontal post box offers an impressive 11.2 litre capacity over combined dimensions of just 270 x 110 x 380mm (width, height, depth). EN13724 compliant and meeting the post box requirements set out in the Secured by Design Homes Guide 2016, it is a great investment for property owners and developers in the UK. The H270-1 communal mailbox can be configured into a large post box bank with ease, with the only limit being available space. 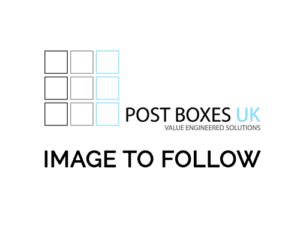 From single installations, up to 400 units plus, Post Boxes UK can meet all your post box requirements. We take care of everything from design to delivery, and we will even install your mail bank to ensure it meets your needs and our exacting standards – please contact us for further details. Installation options for the H270-1 multi-occupancy mailbox include wall recessed, wall mounted, and free standing with support legs. With hundreds of different RAL colours and finishes to choose from, the H270-1 horizontal letterbox can be customised to complement every building. Flame resistant and fire retardant paint options are available to ensure BS476: Parts 6 & 7 compliance and meet strict UK Building Control and Fire Regulations. They are available in a choice of premium finishes for high-end office blocks and residential buildings, with metallic powder, chrome, copper, matt velvet, and satin finishes available in the Post Boxes UK range. Furthermore, the H270-1 mailbox for flats is available with a specialist marine treatment ensuring that the letterbox finish is able to withstand the harshest coastal environment for a longer period than a standard powder coated letterbox. 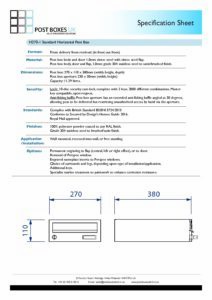 At Post Boxes UK, we aim to deliver your bespoke H270-1 mailbox bank within 4 weeks of confirming your order, however, this depends on the size, quantity, and complexity of your design. Please contact us to discuss your project. For optimal weather, rust and corrosion resistance, the H270-1 multiple occupancy mailbox is manufactured from 1mm stainless steel and electro-galvanised steel. This makes it suitable for internal and external applications. For a smart finish and added weather resistance, choose one of our finishing surrounds for your H270-1 post box. A choice of 20mm or 40mm surrounds are available for wall recessed letter boxes, while 1.5mm sheet surrounds and 15mm volume surrounds are offered for wall mounted and free standing mailboxes. 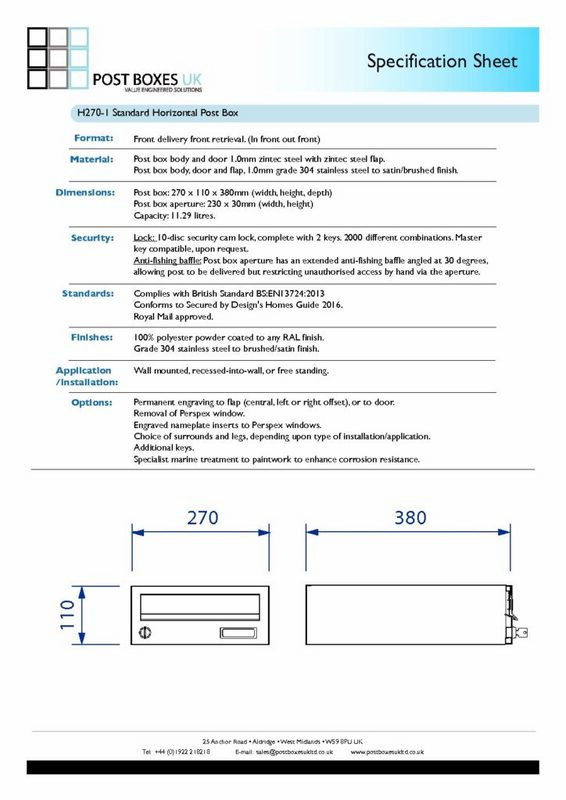 To comply with EN13724, your H270-1 student accommodation post box should not excees 1800mm FFL (finished floor level) in height. Post Boxes UK offers a range of mailbox support legs and pedestal legs to ensure you meet these recommendations in addition to your own specifications. 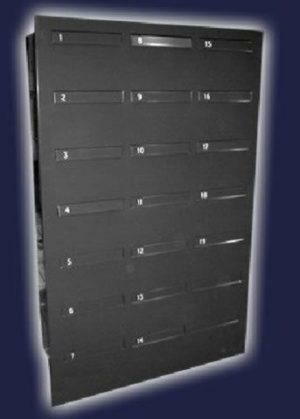 The H270-1 multi-unit mailbox can be customised to complement every office block, apartment building, or student accommodation with numbering and identification. Engraved nameplate inserts, apartment numbers, and laser etched ID numbers can be added with ease. As most mail box banks are installed in high-traffic areas, a good locking mechanism is essential. The H270-1 horizontal post box comes with a robust Eurolock Cam Lock as standard, which satisfies most requirements. For those looking for a higher level of security, Post Boxes UK offers a huge range of locking systems including 5 million differ cam locks, combination locks, RFID/NFC proximity locks, and many more. Please contact us to discuss your requirements. In addition to the set of keys supplied, Post Boxes UK offers replacement keys and locks for the H270-1 secure post box. Discounts are offered for bulk orders, and replacement locking systems are available. Robust, resilient and designed to reduce tampering, the H270-1 wall mounted mailbox meets the requirements set out in the Secured by Design Homes Guide 2016. It is EN13724 compliant, equipped with an anti-fishing device, and it can be customised with an advanced locking mechanism to keep would-be identity thieves at bay. With its low profile and high capacity, the H270-1 horizontal mailbox is a great investment for low-rise apartment buildings, shared office spaces, communal reception areas, and mid-size student lets.